These days tranquility is fast becoming the one thing money can’t buy. When I was a child a great holiday offered an escape from daily life, nowadays increasingly; they’re judged to be successful by how much of our daily lives we can take with us. Hotels and villa rentals boast about their superfast internet, free wifi, and phones in the loo as though the most important thing on earth is to stay connected. I’ve seen dining tables in far-flung places full of adults sharing jokes with friends in cyberspace and ignoring their companions. So when it comes to taking a break I’m increasingly drawn, not to the latest boutique hotel but to the head clearing, leg stretching, equilibrium restoring promise of a trek. For me holidays start the moment I put an ‘out of office’ message on my email and my favourite destinations have regular power cuts or don’t have Wi-Fi at all! Spa breaks are in vogue as the Holy Grail for over wrought executives and hard-pressed parents but when I need a break I take to my feet. I can remain as agitated on a massage table as I am behind my desk. During periods of high stress the strangers stroking me while sitars strum and Om Shanti strewn musak blares from the obligatory iPod dock is enough to make me scream. Instead to obliterate my intrusive and never ending mental to do list, calm the thoughts churning through my head and guarantee a proper, blissful , non interrupted eight hours sleep I favour is a good long walk. Where most holidays try and seduce you into a state of relaxation with a check list of ‘luxuries’ a trek forces mindfulness on its participants. The steady clomp of my Brasher boots on scorched earth or squelching through mud, the wind dusting the a path or whipping the tree branches into a frenzied dance, birds singing or squabbling, and when you stop to catch your breath, the deafening sound of silence as you gaze around you and see an unexploited world , that’s what I find medicinal. It’s a soundtrack it’s easy to forget the existence of in the daily scurry from car or bus, to office and superstore. Some of worlds best adventures are those offered on foot, and nowadays you don’t even need to sacrifice luxury when you take to the wilds. The gap between rich and poor may be at it’s narrowest on wilderness adventures but after a childhood spent in leaky tents on Irelands rainsoaked west coast I’ve warmed to glamping in adulthood in a big way. Sleeping under canvas may not offer the cutting edge in cossetting but sheets with a respectable thread count, scented candles and a hot water bottle are the greatest luxuries on earth when you’re far from home and physically exhauted. This year we scaled the lower Atlas, walking though mud and wattle villages where dogs and kids scattered in our wake, swimming the ice cold rivers that run down from the mountains and arriving weary but wonderfully exhausted at each evening’s unique campsite. Round the crackling fire, with the burble of the guides preparing supper for us nearby, we’d listen to the deafening silence and marvel at how quiet our busy world can be. Supper was served under a carpet of stars, in a billowing tent fit for a Sultan, and afterwards round the still roaring fire we with hot water bottles at our feet we talked long into the night sharing secrets and stories like our ancestors before us. 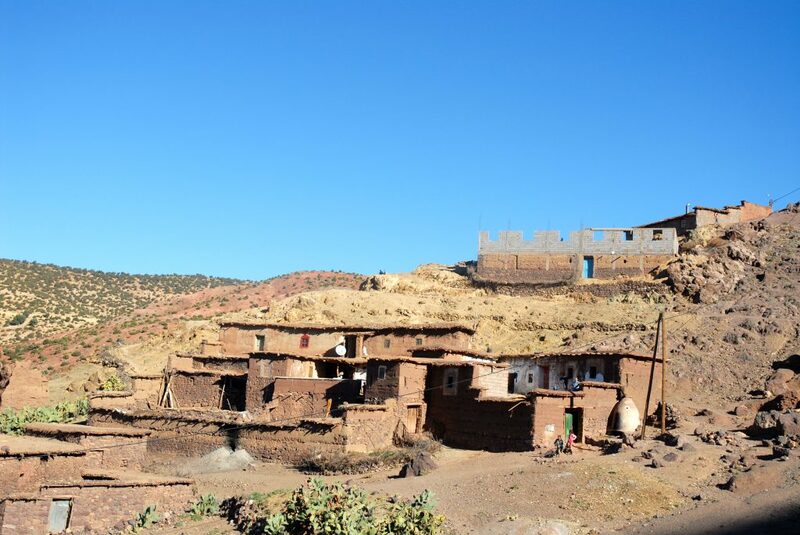 Only an hours drive from the bustle of Marrakech and we were adrift in a sensuosly slow world where civilisation for once manageably small scale. These days many barefoot pleasures come at a Oligarchal prices offering firm proof of how badly we want escape from our relentlessly connected lifestyles. These low impact, planet friendly, soul restoring, excursions are increasingly the siren call for a modern, western world-wearied bunch of exhausted westerners. For me it’s the epitome of real luxury. 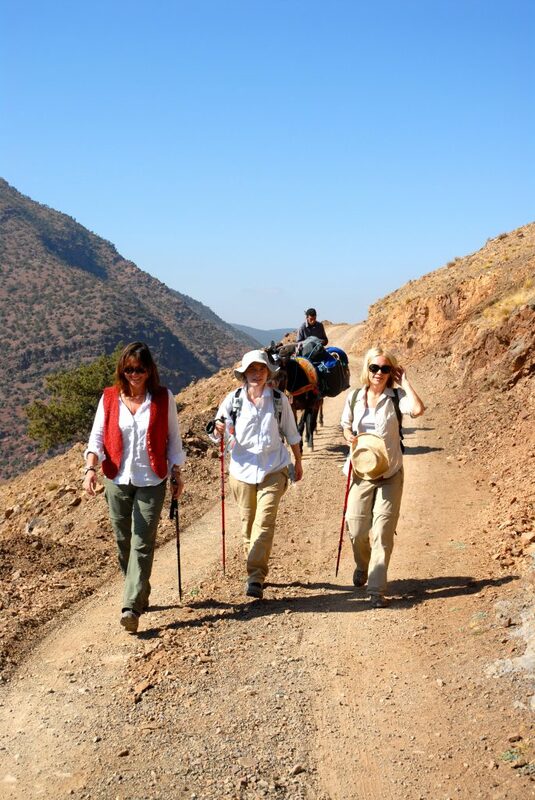 Next February I taking my whole trekking trip across the Sahara. Camels, tents, kids, a whole Arabian nights style caravan with only the dogs left behind to guard the homestead. Best of all they’ve promised me that iphone won’t work. 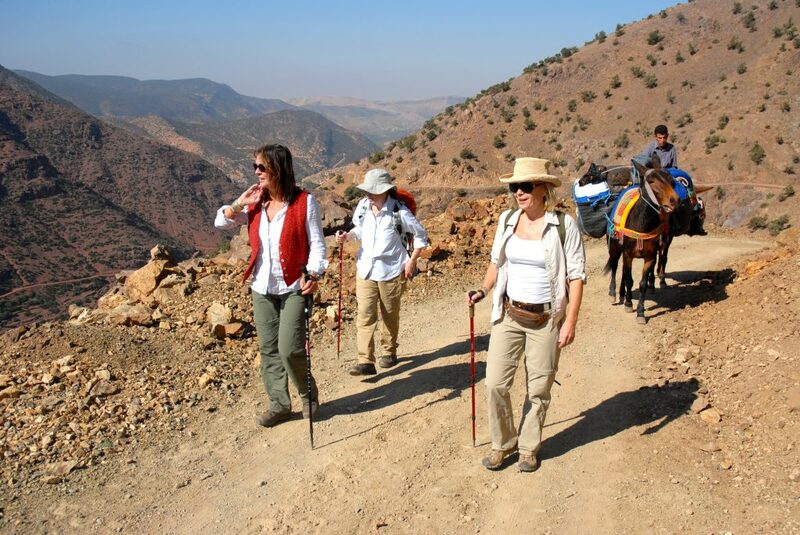 We did a 24 hour trial run in the Higher Atlas last year with Natural High; a small British company that specializes in taking it’s clients off the beaten track,. 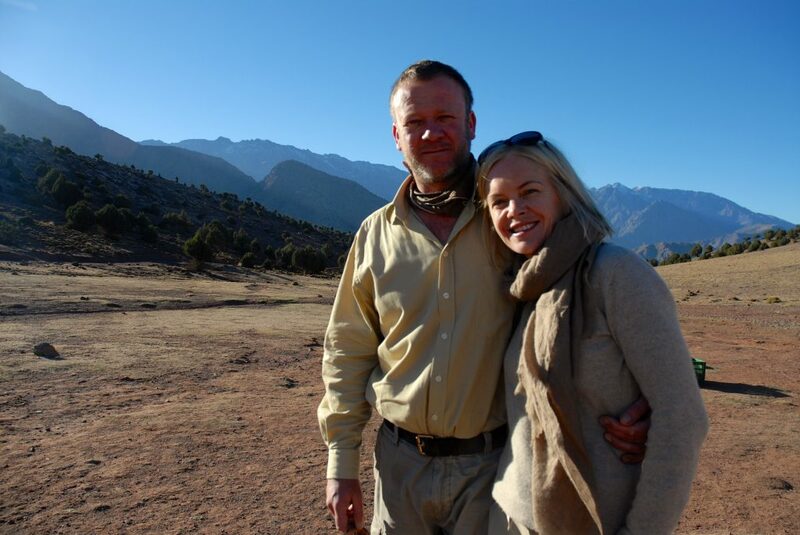 After an all day gentle hike in warm sunshine with chickens scattering at our feet as we walked through mud-baked Berber villages we found ourselves under a carpet of stars, in a billowing tent fit for a Sultan, with delicious food, a roaring fire and hot water bottles at our feet. Unusually we won’t have to remortgage to afford it either. These days barefoot pleasures too often come at a Oligarchal prices offering firm proof of how badly we want escape from our relentlessly connected lifestyles. Camping isn’t for everyone but adventures that take you away from the madding crowd are definitely on the rise and in a frenetic, linked up world it’s not hard to see why. Wilderness trips are the new luxury and the prices often seem index linked to the distance they put between you and your normal life. This year we scaled the lower Atlas with Natural High, walking though mud and wattle villages where dogs and kids scattered in our wake, swimming the ice cold rivers that run down from the mountains and arriving weary but wonderfully exhausted at each evening’s unique campsite. Round the fire, with supper being cooked for us nearby, we’d listen to the deafening silence and marvel at how quiet our busy world can be. These low impact, planet friendly, soul restoring, excursions are increasingly the siren call for a modern world weary bunch of exhausted westerners and represent for me the epitome of real luxury.